Ms. Rhea has moved to a new domain of her name, Rhea Bue. Expect more stylish post from her. What day today? It is Sunday everyone. Time for another Sunday Spotlight. For this day, I will feature the Rhea Bue of Bebe-Doll.net. BEBE-DOLL.NET is my fashion and beauty blog. All of my looks, reviews, tutorials and inspirations are found in my blog. How do express your fashion style? I have a very “versatile” style because I don’t just stick to one “peg”/concept… I love to experiment with different styles and see which looks nice on me. What are the two pieces you can’t live without? Why? Who is your fashion icon? How did he/she influenced your style? I’ve got more than one fashion icon. Considering the sudden increase of the fashion bloggers population, there’s a lot to choose from! I even get influenced by ordinary fashion bloggers because I believe that all of them (big or small) has a unique style and I really appreciate them. What would you like to tell to those aspiring fashion bloggers? Never be afraid to try and explore new things. Embrace change if it’s for a good reason. Always get inspired by people no matter how big or small they are. Be confident with yourself as this is the key to success in every fashion blogger. What would you like to ask to the next Sunday Spotlight blogger? 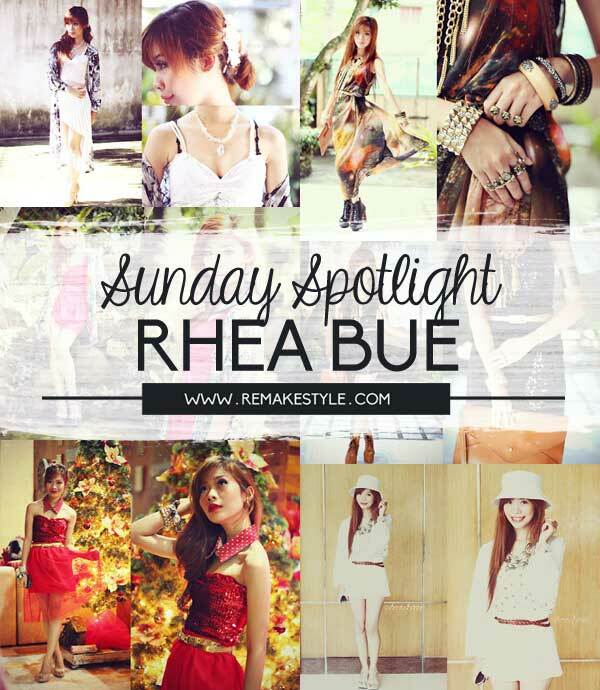 Ms. Rhea is also the blogger behind StyleImprints.com. If you love her style, follow her at Lookbook @iamthedoll. No problem. I love you style anyway. That must be cool. :) She's really inspiring. Thanks. I enjoyed doing it with her.